Plans have been announced for a £58m "justice quarter" and a new business district in Bradford city centre. The city's magistrates' and coroner's courts will be moved next to the Crown Court as part of the development. 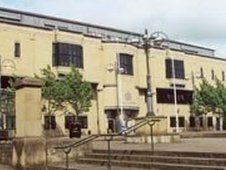 A business district will then be built on the former site of the two courts, Bradford Council said. The scheme has evolved from the city centre master plan. It is being funded by the council, Yorkshire Forward and Her Majesty's Courts Service. The 2004 city centre master plan proposes a transformation of the city centre through the reintroduction of water features and the development of a business district.